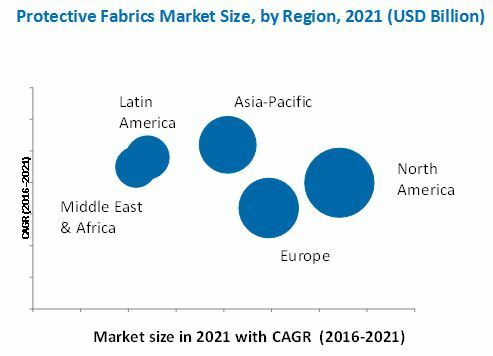 [153 Pages Report] The protective fabrics market size is estimated to have been USD 3.13 billion in 2015 and is projected to reach USD 4.0 billion by 2021, registering a CAGR of 4.2% between 2016 and 2021. In this study, 2014 has been considered as the historical year, 2015 as the base year, and 2016–2021 as the forecast period for estimating market size of protective fabrics. The global protective fabrics market has been segmented based on type, raw material, end-use industry, and region. Fire & heat-resistant fabric is expected to play a key role in fueling the growth of the overall protective fabrics market owing to its unique properties, which makes it suitable for use in a wide range of applications. The demand for protective fabrics in law enforcement & military and healthcare application is increasing rapidly, thereby, driving the protective fabrics market. Government authorities are increasingly concerned over the health and safety of workers at their work place. Many government regulations and standards compel the end-use industries to provide protective clothing to the workers working in hazardous environment. For instance, according to the 2010 memorandum of the U.S. Occupational Safety and Health Administration (OSHA), it is mandatory for the workers in the oil & gas industries to wear heat- and flame-resistant clothing. It also requires the workers at construction sites to wear high visibility safety apparels, as they are exposed to either traffic or moving machinery. The increased demand for protective clothing drives the market for advanced protective fabrics. The value chain of the protective fabrics market starts from raw material suppliers. The key components of protective fabrics depend on the type of raw material used such as aramid, PBI, polyamide, cotton fibers, polyolefin, polyesters, and others. The raw materials are synthesized to form a protective and comfort fabric, which is then processed by protective fabrics producers. Using fabric as raw material, protective fabric manufacturers cut and sew the fabric for end users. The manufacturing process transforms the raw material into useful fabrics such as fire & heat-resistant fabric, chemical-resistant fabric, UV-resistant fabric, and others. In order to provide innovative fabrics, the fabrics used are chosen based on their properties such as high temperatures, resistance to abrasion, and non-conductive properties. After manufacturing, the process is taken for distribution and then retailing of the protective fabrics. The end-use industries using protective equipment made of protective fabrics are building & construction, oil & gas, firefighting, healthcare, law enforcement & military, and others. Some of the major players involved in manufacturing protective fabrics include E. I. Du Pont de Nemours and Company (U.S.), 3M Company (U.S.), Koninklijke Ten Cate NV (Netherlands), and Teijin Limited (Japan) among others. In April 2016, 3M company has developed a 3M Scotchlite Reflective Material-series 5600 fire coat comfort trim, used to make turnout gears. This new design makes the turnout gears more comfortable for firefighters. In February 2016, Teijin Limited (Japan) developed two new fabrics of Twaron and Technora para-aramid fibers. These fabrics are used to protect facilities from airborne volcanic fragments up to 10 cm. In March 2016, 3M company expanded its USD 150 million R&D facility at Carlton, Australia. The facility was built to develop innovative products across 46 technology platforms to generate solutions for customers. In June 2015, Lorica International (U.S.) signed a distribution agreement with Fuji Electric Industries Co. Ltd. (Japan) for selling and distributing Lorica products in Japan, Southeast Asia, and China. In September 2015, Milliken & Company (U.S.) acquired Springfield LLC (U.S.), a producer of FR fabrics. This acquisition helped the company to improve their grade of protective apparels used by for military, first responders and industry workers. 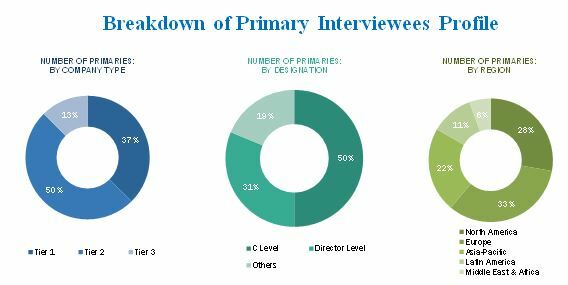 “Thisstudy answers several questions for the stakeholders, primarily, which market segments to focus in the next two to five years for prioritizing efforts and investments”. This report categorizes the global protective fabrics market based on type, application, and region. What are new product protective fabrics companies are exploring? The global protective fabrics market projected to reach USD 4.0 billion by 2021, registering a CAGR of 4.2% between 2016 and 2021. The market is driven by increased demand from end-use industries such as building & construction, oil & gas, firefighting, healthcare, law enforcement & military, and others. The increasing concern for the safety of military personnel is also a key factor supporting the growth of the protective fabrics market. Protective fabrics are textile related products that offers the wearer protection from hostile elements, objects, or environments and prevents the risk of injuries. They are developed as per the requirement of a specific application. There are various protective fabrics based on their properties such as fire-resistance, chemical-resistance, antistatic, abrasion-resistance, and UV-resistance. They are used in the production of bulletproof vests, fireproof clothing, chemical protective clothing, and many other protective clothing & equipment. The end-use industries for protective fabrics include oil & gas, building & construction, military & law enforcements, mining, and firefighters. On the basis of type, fire & heat-resistant fabrics is the fastest-growing type of protective fabrics. The rising demand from end-use industries is driving the market for fire & heat-resistant fabrics. The demand for fire & heat-resistant fabrics is expected to increase as these fibers are preferred for their ultra-high strength and high thermal- and fire- resistance. Due to their properties, they are highly preferred in security & protection applications. The increased demand for protective apparels such as helmets, jackets, fire resistant clothing, firefighting gears, and equipment are driving the fire & heat-resistant fabrics market. On the basis of region, North America is the largest protective fabrics market and is expected to witness moderate growth during the forecast period. Various safety regulations in the region mandate the use of protective clothing in various end-use industries. Asia-Pacific is the fastest-growing market for protective fabrics, in terms of value. Growing industrialization and infrastructure development in the region offer enormous opportunities for the growth of the protective fabrics market in the region. China is the largest market in the region. The growth in personal protection equipment and protective clothing industries is projected to increase the demand for protective fabrics in the region. The workers in the construction industry are often exposed to risks during welding, cutting, nailing, and others. Safety glasses are required to prevent the entry of foreign objects in the eye during work operations. Moreover, the protective clothing is required for the protection of foot, hand, head, and hearing. The clothing is made of fabrics that offer the advantage of lightweight, chemical resistance, and thermal resistance. The trend toward lightweight and durable clothing has led to the increased demand for nylon scrim, which is coated with polyvinyl chloride. These materials offer resistance to water and moisture. These waterproof materials resist the attack of chemicals, fungus, mold, and mildew. Majority of the frontline authorities in the oil & gas industry are exposed to life-threatening chemical hazards. The danger arises from building well foundations and establishing tanks to hydraulically fracturing wells. Moreover, in offshore drilling there is an increased risk of blowouts, release of hydrogen sulfide, and formaldehyde that pose threat to the professionals working in such locations. Thus, in refineries, hazard assessment is carried out to procure personal protective equipment. The protective equipment made up of specialized fabrics is used to prevent the workers from various physical hazards. The major hazards in the oil & gas industry include fire & explosion, hand & eye injuries, hearing loss, and others. Depending on which worker is exposed to which hazard, the selection of protective clothing is done. The regulations pertaining to the use of protective clothing are driving the market for personal protective equipment, which is turn drives the protective fabrics market. For instance, the personal protective equipment standards are defined in Occupational Safety and Health Administration (OSHA), which states that the employer is responsible for training and providing protective equipment to the workers. The firefighters largely depend on the protective apparel to meet the requirements of their challenging job. Firefighting suits are designed to protect the firefighters against the chemical exposure and risk of being injured during extreme environment. The fabrics are largely used to produce clothing, as they are lightweight and comfortable. The protective clothing made of fibers is used to offer fire resistance, strength, durability, and other advantages. The fiber on exposure to heat thickens, thus increasing the protective barrier between the user and the source of heat. This in turn, helps in reducing injuries and provides greater time to escape during an emergency. The firefighters are not only exposed to chemicals but also to toxic industrial chemicals. Thus, different types of protective fabrics are used to develop clothing for different types of exposures. For instance, high volume fire suits are used during water-based emergencies and technical rescue suits are deployed in non-structural firefighting situation. The specialty fabrics that are used to produce protective clothing include FR fabrics, chemical-resistant fabrics, and antistatic fabrics. What are the upcoming product type of Protective Fabrics? Furthermore, since concrete construction now takes place in almost all weather conditions, the need for clothing that offer protection from extreme temperatures is required. The fabrics used to produce clothing for various applications are chosen according to their end-use requirements. The protective fabrics mostly used in building and constructions offer visibility and arc protection. Higher pricing of specialized fabrics and the requirement of huge investments for R&D acts as a restraint for the protective fabrics market. The competitiveness of the protective fabrics market is continuously increasing with innovative and new product launches. Strategic developments are mostly undertaken by major players such as Teijin Limited (Japan), Koninklijke Ten Cate NV (Netherlands), W. L. Gore & Associates, Inc. (U.S.), E. I. du Pont de Nemours and Company (U.S.), and 3M Company (U.S). 12.12 W. L. Gore & Associates, Inc.